You say the Stairmaster is too boring? Have you finally decided to get outside and get some exercise? Thousands of people know where you can go. Some people go there every morning before work. It's right in the middle of Phoenix. Surrounded by freeways, neighborhoods, and resorts you will find one of the most popular destinations for a hike in Phoenix: Piestewa Peak. This area was renamed and used to be known as Squaw Peak. The new name was given in memory of Lori Piestewa, a Tuba City, Arizona soldier who gave her life in Operation Iraqi Freedom in 2003. The name is pronounced: py- ess- tuh-wah. 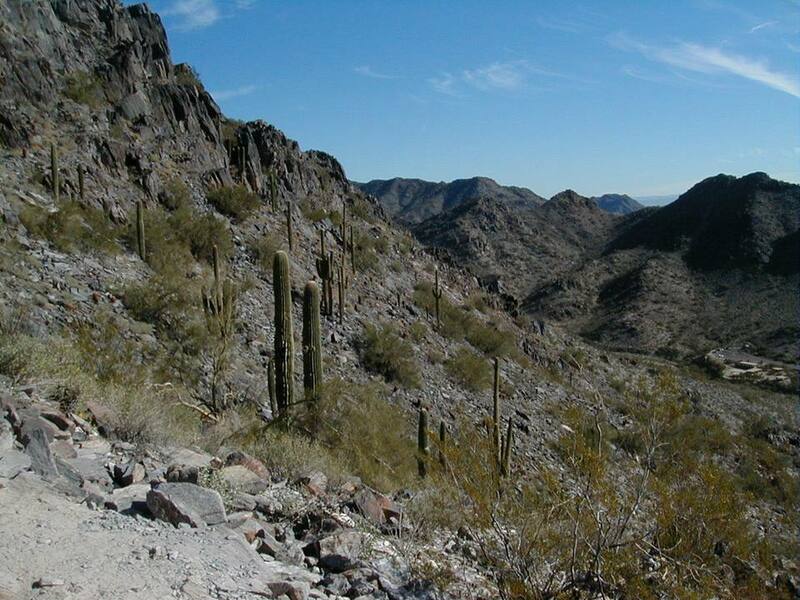 There are two main attractions at Piestewa Peak: the Summit Trail and the Circumference Trail. The Summit Trail is by far the more traveled. It is about 1.2 miles to the top. The trail itself is rocky and has a stair effect. There are convenient stops along the way for those of us who either need to take a breath or those of us who want to get a breathtaking view of the city. The city views are all wonderful, and you don't have to go up very high to see them. The Summit Trail provides a decent workout even for those experienced hikers. It is rated as a moderate hike. At the highest point is at 2,608 feet, total elevation gain is 1,190 feet. The Circumference Trail at Piestewa Peak is longer at about 3.75 miles and is a much more gradual ascent. It takes longer, of course, but kids can do this one and the views are just as good. It is also less crowded than Summit, which at times seems like the Interstate at rush hour. To get to the Circumference Trail, pass the Summit Trail Parking area and go to the last ramada. Whichever trail at Piestewa Peak you decide to hike today, make sure you are wearing good hiking shoes, a hat, sunglasses and that you bring enough water. I addition to the 360-degree fantastic views, enjoy a variety of desert cactus, including saguaro, barrel, hedgehog, pincushion, and prickly pear. Be especially alert around the cholla; those spines are painful to remove once they attach to your body. Piestewa Peak is part of the Phoenix Mountains Preserve, a Phoenix Point of Pride. There are a total of 31 Phoenix Points of Pride that have been designated as such by a Phoenix Pride Commission. According to the Commission, "The Points of Pride consist of parks, cultural facilities, historic residences and mountain peaks. All these unique locations are found within the Phoenix city limits and contribute to the quality of life in the Valley." The Piestewa Peak Recreation Area is located at 2701 E. Squaw Peak Drive, which is right near 24th Street and Lincoln. The park is open from 6 a.m. to 10 p.m. No dogs are permitted.